Book Bears now know that. I read a random page from the book. That’s all it took. They were hooked. They asked me to read this book aloud to them, at the end of our Book Bear sessions. No problem. Happy to do that. Reading aloud really is the Holy Grail. The next meeting I read aloud for the last 5 or 10 minutes. That turned out to be a teaser. They wanted more. The following session, the children couldn’t stand it any longer. I read for 15 minutes. And then I knew that the Book Bears wanted read-aloud as much as they wanted to read. I asked Ashvik after our Book Bears session, “Did you like the book?” It was a terrific book by Kate DiCamillo. We added a full thirty minutes to the end of Book Bears. That meant we went from discussing our current book for thirty minutes, to hearing Jennie read aloud Summer of the Monkeys for thirty minutes. These kids stayed. Every parent loved it. Last week we got to page 36. You have no idea all that we read aloud, and the wonderful stops to talk about what happened. Might as well have been 360 pages. Jay Berry and Grandpa have come up with a plan to catch the monkeys. There are thirty monkeys and one chimpanzee. The reward for each monkey is $2.00. The reward for the chimpanzee is $100.00. That sparked questions, and math calculations. Two dollars didn’t seem like much to the Book Bears, but one hundred dollars did. We stopped to talk about when the book was written (they were amazed that it was written the same year I was married), yet we knew the story was long before that. Late 1800’s. I took a wild stab and guessed that the money had multiplied ten times. We had a great math session, recalculating and adding each $2.00, plus the $100.00. No calculators, no pencils. It was the best. But, my guess was wrong; the money had far more than grown ten times. I can’t wait to tell Book Bears that our calculation of $1,060.00 in todays dollars is well short. Since we were only on page 36, we stopped to calculate how many pages we would need to read in order to finish the book by June. Not looking good. The children asked me to use my iPhone calculator to figure this out. We huddled together. Seriously. They were a little worried. I said, “To make the math easy, let’s say we’re on page 40. The book has 290 pages. Subtract the 40 we have read, and we have 250 pages left to read in five more meetings.” Not good, because we stop all the time to talk. That’s what happens with a good book. We’re adding another session in order to read aloud this book. I left the library feeling like all the words we had spoken were now stars shooting out of my body. I was full of stars. Never underestimate the power of reading aloud, no matter the age. Words are magic, aren’t they? They take us to places, make us understand, make us laugh and cry. When words are well crafted, they leave a ‘forever’ mark. E.B. White’s words do that. Kate DiCamillo’s words do that. So do Wilson Rawls’ words. 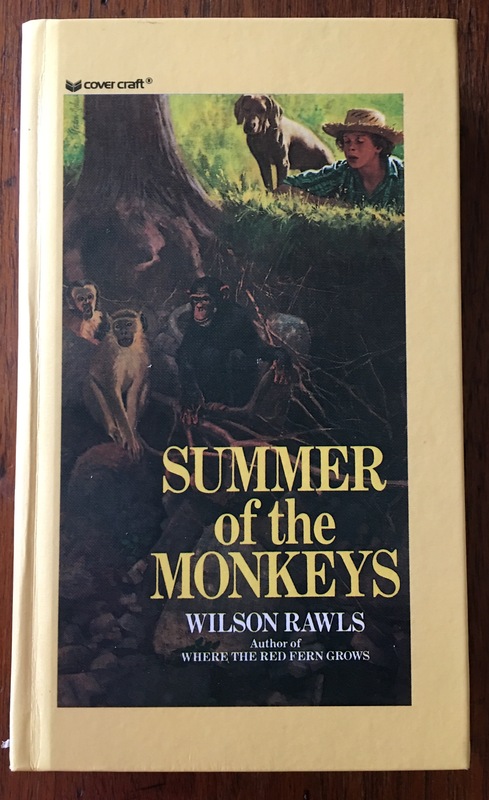 If you love boys and dogs, grandpas, incredible adventures, and one of the best stories written, Book Bears recommends Summer of the Monkeys. I do, too. This entry was posted in chapter reading, children's books, Early Education, reading, reading aloud, Teaching young children, wonder and tagged Book Bears, chapter reading, children's books, Early Education, reading aloud, reading books to children, Summer of the Monkeys, Wilson Rawls. Bookmark the permalink. Thank you! Glad you enjoyed it. The book is terrific. Haven’t been a part of a book club in ages! It’s lots of fun and a great way to encourage children to read. Agreed! How do you choose the books? Often a book is recommended to me. When it comes to knowing if it’s the right book for the group of children, I go on my gut. After a gazillion years of teaching and reading aloud, I can usually tell. Thanks! My daughter loves that book. 🙂 While my kids read all the time, we still do read-alouds with them. That is wonderful! I had not read the book until last summer. I’m so glad these children in Book Bears really want me to read the book to them. Reading aloud is fabulous. Michael has an auditory processing problem, so he reads slowly although he is accurate. We read together. He reads one page, I read three or four. That way we get through the book fast enough to keep the magic alive. I love that idea of sharing the reading. The most popular thing here is reading to a dog. Libraries have started that program, and they are swamped with children signing up. They have found that many children like Michael do well reading to a soft loving dog who listens no matter how slowly they read. That is such an innovative idea. I like the way you were able to sneak in the math without the children realizing it. Very Impressive reading club worth emulating! Yes! And the children thought the math was fun. Next time they’ll get to recalculate. Many thanks, Peter. Glad you enjoyed this. What a beautiful experience for you and the kids. This book sounds amazing and one I wasn’t familiar with. Sounds like the kids are hooked. You do such a great job of keeping their interest, which is quite an accomplishment these days. Thanks, Darlene. I think it’s as good as his “Where the Red Fern Grows”. I meant to say in the post that after 20 minutes of Book Bears they asked, “Can you read the monkey book now?” Wow! That’s a great quote from the book, Jennie. No wonder the kids enjoyed it so much. The book sounds wonderful, but the time, energy and emotion that you put into this group is really amazing, Jennie. I think just knowing that an adult cares enough to do that is a great experience for these kids. Thank you Dan! I do love it, and it makes a difference with children. It does, because it shows. You can’t fool children. You hit the nail on the head, Dan. Well done, Jennie. Huge hugs. Many thanks and hugs, Teagan! Thank you, Susan! Enthusiasm is contagious. I stop often when I read aloud to have discussions. Today at the library I stopped to look at Roman numerals in “My Father’s Dragon” with children. They had no idea how to read them. Learning can be fun! If you liked “Where the Red Fern Grows”, this one will be a favorite. As a retired high school teacher, I am uplifted to Read about your experiences reading aloud to your Book Bears. They are so fortunate to have you, Jennie! Thank you, John. Coming from you, that means a lot. Thanks, Jennie – I’m a fan. That was also a magical read aloud in my third grade classroom years back. Terrific book! Reading your posts brings tears to my eyes sometimes-celebrating the goodness you are doing and missing it much. Thank you so much, Tammy. I wish I’d read this when I was younger. Jennie, I love hearing about your reading sessions and these Book Bear sessions are fabulous. This sounds like a wonderful book, and I love the quote from it you chose to share. Books are indeed magic, and read aloud sessions are magic in the way they turn children onto books, reading and words. I love the way you incorporated maths into this session. There is much more to a reading session than simply reading the words on the page. Discussion and relationships are what it’s all about, and opening up little minds to think and share ideas. Somehow, I think you’d perform magic with any book you read to your little Book Bears. Thank you, Tina! It is priceless. It’s so wonderful to capture a child’s imagination with a book… so much that they want to hear it all!! Thanks, Diana. That passage swept me off my feet. You will love the book. How old is Tornado Boy? Apologies that I don’t remember. A perfect read aloud for 3rd graders. The 2nd graders in my Book Bears group are more like 3rd graders. Wonderful! 4 is what I teach. Love that age! I’ve never been a great out loud reader but have done the best with it when necessary. It has helped my children and a stepdaughter with their reading so I know how important it is. It will pull them into a story like self reading my not immediately. Very much enjoyed reading this post. I love your words and your story, Marlene. You’re so right. Thank you, and I’m glad you enjoyed the post. I love your posts about the Book Bears, Jennie. They’re so engaging and vivid. This one is no exception. Happy Weekend hugs. I loved that quote, just want to hug that wrinkled old grandpa.. 😀 and I love the name Book Bears. And I can see why your class so worried the story would not get finished..
Aww… that’s so nice, Sue. And, thanks for sharing your wonderful childhood story of The Borrowers. Debby, do you know “Where the Red Fern Grows”? This book is the author’s other winner. I read it last summer, shared a page or two with Book Bears, and the rest is still an unfolding, sit on the edge of your seat read aloud. Yes, I may have to add another session to get through 250 pages. Life is good! Thank you, Debby. Yes, life is good, because of reading and reading aloud. I promise, cross my heart, that you will be consumed by this book. Today at school it happened again, sparks and deep discussions about the chapter book we’re reading. Blog post! I remember you mentioning Summer of the Monkeys before and I can’t believe I STILL haven’t read it. This time it’s going on my list. Great post! Reading aloud really is the Holy Grail. I love this line and it is so true. How wonderful to “hook” kids on books in this way. Yes!! It really is true, as you know. Thanks so much, Dayne. What an amazing way to encourage children to establish their love of reading at a fairly young age!! And great choices in book!